Where seen? 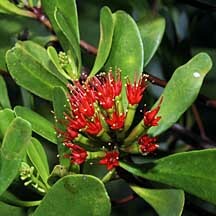 This pretty plant with plasticky leaves and tiny red flowers is sometimes seen in good mangroves. It is found in the back mangroves, in soft, muddy substrates where tidal inundation is rare. Also along waterways with a permanent and strong input of freshwater. It was formerly called L. coccinea. Features: Short shrub to tree up to 25m tall with a trunk 50-65cm in diameter. Bark dark and deeply fissured. Some may have slender knee roots. Leaves spatula shaped with oval ends (2-8cm), thick and fleshy, arranged in a spiral. 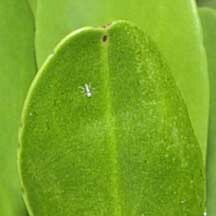 There is small gland at the leaf tip that resembles leaf nodules and are believed to contain nitrogen fixing bacteria. Flowers small (2-3cm) in dense bunches, bright red with five tiny petals (the stamens are much longer than the petals). The flowers are fragrant and produce lots of nectar. According to Tomlinson, this species appears to be predominantly pollinated by birds, especially sunbirds and honey eaters, with bees and wasps as additional visitors. The small fruits are ribbed, corky and float, and dispersed by water. Each fruit contains one seed. Sometimes mistaken for Chengam (Scyphiphora hydrophyllacea) which has its leaves arranged in a spiral. 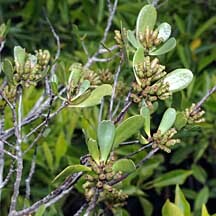 According to Giesen, although occurring throughout Malaysia and Indonesia, L. littorea and L. racemosa practically exclude each other in habitat and have never been collected in exactly the same stand. The exact cause of this different ecological behaviour is not yet known. Human uses: According to Burkill, the timber is hard and durable, and thus sought after for marine pilings as well as bridges, wharves, parts of canoes and other household items. There are reports that pier posts made of the tree were still sound after 20-50 years. When first cut it smells of roses. But large-sized timber is rare. 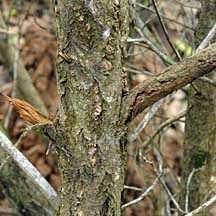 It is also used as firewood. 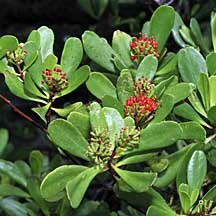 Status and threats: It is listed as 'Endangered' on the Red List of threatened plants of Singapore. Small gland at the leaf tip. Stamens much longer than petals. Lumnitzera littorea on Total Vascular Flora of Singapore Online: photos and fact sheet. Lumnitzera littorea on the NParks Flora and Fauna website: photos and fact sheet. 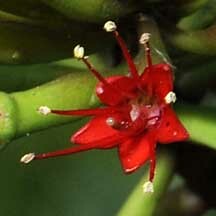 Teruntum merah (Lumnitzera littorea) Ng, Peter K. L. & N. Sivasothi, 1999. A Guide to the Mangroves of Singapore I (Plant Diversity). Singapore Science Centre. 168 pp. Giesen, Wim and Stephan Wulffraat, Max Zieren and Liesbeth Scholten. 2006. Mangrove Guidebook for Southeast Asia (PDF online downloadable). RAP publication 2006/07 Food and Agriculture Organization of the United Nations Regional Office for Asia and the Pacific Bangkok. Hsuan Keng, S.C. Chin and H. T. W. Tan. 1990, The Concise Flora of Singapore: Gymnosperms and Dicotyledons. Singapore University Press. 222 pp. Corners, E. J. H., 1997. Wayside Trees of Malaya: in two volumes. Fourth edition, Malayan Nature Society, Kuala Lumpur. Volume 1: 1-476 pp, plates 1-38; volume 2: 477-861 pp., plates 139-236. Tomlinson, P. B., 1986. 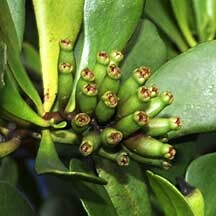 The Botany of Mangroves Cambridge University Press. USA. 419 pp. Ng, Peter K. L. and Wang Luan Keng and Kelvin K. P. Lim, 2008. Private Lives: An Expose of Singapore's Mangroves. The Raffles Museum of Biodiversity Research . 249 pp. Burkill, I. H., 1993. A Dictionary of the Economic Products of the Malay Peninsula. 3rd printing. Publication Unit, Ministry of Agriculture, Malaysia, Kuala Lumpur. Volume 1: 1-1240; volume 2: 1241-2444. FREE photos of mangrove trees and plants. Make your own badge here.